American president and conservationist (26th, 1901-09) whose term included efforts to conserve national resources, especially the passage of the Newlands Reclamation Act (1902). He was the first president to ride in an automobile (1902), go underwater in a submarine (1905), or fly in an airplane (1910). Immediately after leaving his presidency, he undertook a safari to Africa as hunter and naturalist. In 1913, he travelled on a scientific expedition to the interior of Brazil which produced geographic, geological, and zoological information, and almost two thousand specimens of birds and mammals were collected for the American Museum of Natural Science. [p.12] FROM field naturalists who knew Roosevelt he always received profound and unstinted admiration; they knew that his greatest pleasure lay in seeing and learning; that he found infinite joy in studying wild animal life in its native haunts; that he had the observing eye and keen mind of the ideal naturalist. I met him in Africa in 1912 on the Uasin Gishu Plateau. It was morning and our American Museum Expedition was marching toward the N’Zoia River, when one of the boys called my attention to a safari, two miles or so to the south. With the thought that it might possibly be the Roosevelt Expedition. I sent a runner to make inquiry, while we proceeded to the banks of the river and made camp. The runner soon returned, stating that he had met a runner halfway, that it was the Roosevelt party, and that they were going into camp on the edge of the marsh not far from where we had seen them. When our camp was made, we started out on our horses in the direction of the marsh, but when about halfway met the Colonel with Kermit, and two others of his party. We all returned to our camp and a good part of the afternoon was spent making arrangements for an elephant hunt for the next day. Within an hour or two after leaving camp in the morning, we picked up the trail of a small herd of elephants, and as they were easily tracked through the grass, we moved very rapidly. At about eleven o’clock, while we were following the trail quite casually, someone in advance heard a sound which resulted in our coming to a standstill. We made a short detour to the left, and a few minutes later were looking at a small band of cows and calves enjoying their midday siesta under a clump of bush. We advanced under cover of a large ant hill to within about fifty yards, from which point we looked them over carefully and decided which were valuable for our scientific purpose. I indicated the particular cow that I wanted the Colonel to shoot for the American Museum group. Of course at this distance from the elephants we could speak only in lowest whispers and every move was guarded. I waited for the Colonel to take a shot, expecting him to do this from behind the ant hill where we were afforded a splendid protection against a charge, but he started forward toward the elephants and I, with Kermit, was obliged to follow closely. My impulse was to tell him that I wanted him to shoot the cow and not “take her alive!” He continued to go steadily forward, however, intending to get so close that there could be no doubt of the effectiveness of his shot; but the elephants suddenly began moving in our direction, at which he promptly fired. This did not stop their advance, but rather accelerated it instead, so that quick action was necessary. When we got through we had four dead elephants. All of the party, except the Colonel [p.13] and myself, returned to camp to send out tools, equipment, and men, preparatory to taking care of the great skins and skeletons of the four elephants. He and I sat down under a tree with our luncheon, and for two or three hours we conversed of intimate things. For a number of months the Colonel had seen no one from home except the members of his own party. We were fresh from the United States and there was much to talk of. He spoke much of his family, of Mrs. Roosevelt, and his sons and daughters. It was then that I learned to love Roosevelt. It is not an easy thing to give expression to the thoughts that come to my mind of this man who has so recently passed beyond our range of vision. What I feel most is that whereas Roosevelt is gone, his influence seems greater than ever. Many of us will feel, with respect to the things that Roosevelt wanted us to do and which we never seemed to have time to do, that now we have time for nothing else. “I speak of Africa and golden joys”; the joy of wandering through lonely lands; the joy of hunting the mighty and terrible lords of the wilderness, the cunning, the wary, and the grim. In these greatest of the world’s great hunting-grounds there are mountain peaks whose snows are dazzling under the equatorial sun; swamps where the slime oozes and bubbles and festers in the steaming heat; lakes like seas; skies that burn above deserts where the iron desolation is shrouded from view by the wavering mockery of the mirage; vast grassy plains where palms and thorn-trees fringe the dwindling streams; mighty rivers rushing out of the heart of the continent through the sadness of endless marshes; forests of gorgeous beauty, where death broods in the dark and silent depths. There are regions as healthful as the northland, and other regions, radiant with bright-hued flowers, birds and butterflies, odorous with sweet and heavy scents, but treacherous in their beauty, and sinister to human life. On the land and in the water there are dread brutes that feed on the flesh of man; and among the lower things that crawl, and fly, and sting, and bite, he finds swarming foes far more evil and deadly than any beast or reptile; foes that kill his crops and his cattle, foes before which he himself perishes in his hundreds of thousands. The dark-skinned races that live in the land vary widely. Some are warlike, cattle-owning nomads; some till the soil and live in thatched huts shaped like beehives; some are fisher-folk; some are ape-like naked savages, who dwell in the woods and prey on creatures not much wilder or lower than themselves. The land teems with beasts of the chase, infinite in number and incredible in variety. It holds the fiercest beasts of ravin, and the fleetest and most timid of those beings that live in undying fear of talon and fang. It holds the largest and the smallest of hoofed animals. It holds the mightiest creatures that tread the earth or swim in its rivers; it also [p.14] holds distant kinsfolk of these same creatures, no bigger than woodchucks, which dwell in crannies of the rocks, and in the tree tops. There are antelope smaller than hares, and antelope larger than oxen. There are creatures which are the embodiments of grace; and others whose huge ungainliness is like that of a shape in a nightmare. The plains are alive with droves of strange and beautiful animals whose like is not known elsewhere; and with others even stranger that show both in form and temper something of the fantastic and the grotesque. It is a never-ending pleasure to gaze at the great herds of buck as they move to and fro in their myriads; as they stand for their noontide rest in the quivering heat haze; as the long files come down to drink at the watering-places; as they feed and fight and rest and make love. The hunter who wanders through these lands sees sights which ever afterward remain fixed in his mind. He sees the monstrous river-horse snorting and plunging beside the boat; the giraffe looking over the tree tops at the nearing horseman; the ostrich fleeing at a speed that none may rival; the snarling leopard and coiled python, with their lethal beauty; the zebras, barking in the moonlight, as the laden caravan passes on its night march through a thirsty land. In after years, there shall come to him memories of the lion’s charge; of the gray bulk of the elephant, close at hand in the sombre woodland; of the buffalo, his sullen eyes lowering from under his helmet of horn; of the rhinoceros, truculent and stupid, standing in the bright sunlight on the empty plain. These things can be told. But there are no words that can tell the hidden spirit of the wilderness, that can reveal its mystery, its melancholy, and its charm. There is delight in the hardy life of the open, in long rides rifle in hand, in the thrill of the fight with dangerous game. Apart from this, yet mingled with it, is the strong attraction of the silent places, of the large tropical moons, and the splendor of the new stars; where the wanderer sees the awful glory of sunrise and sunset in the wide waste spaces of the earth, unworn of man, and changed only by the slow change of the ages through time everlasting. 1 Quoted from the Foreword of African Game Trails, through the courtesy of Charles Scribner’s Sons. Science Quotes by Theodore Roosevelt. 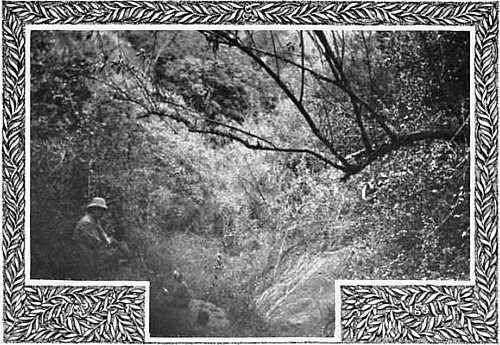 Personal Glimpses of Theodore Roosevelt - memorial tribute by David Starr Jordan in Natural History Magazine (1919). Roosevelt, the Man of Abundant Life - memorial tribute by Gifford Pinchot in Natural History magazine (1919). Theodore Roosevelt - context of his “A Country Without Trees” quote - Medium image (500 x 350 px). Theodore Roosevelt - context of his “A Country Without Trees” quote - Large image (800 x 600 px). The Wilderness Warrior: Theodore Roosevelt and the Crusade for America, by Douglas Brinkley. - book suggestion.